We will fly you to a remote Georgian Bay Island, where you can explore its natural beauty, while overlooking Georgian Bay. Hike the trails and shorelines and bring your suit for a dip in Georgian Bay. 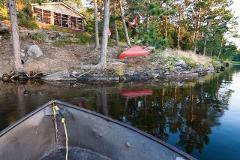 We will fly you to Partridge Lake, which is actually 3 lakes in one, all accessible to you. 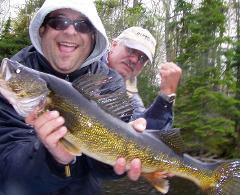 Northern pike to 15 lbs, lots of smallmouth bass 2-5 lbs, largemouth 4-6 lbs and walleye 2-4 lbs. Boat and gas included. We will fly you to Jake Lake, for a minimum TWO NIGHT STAY. Fishing is for small mouth bass and pike, some of the pike have been up to 23 lbs. 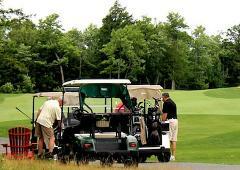 Looking to getaway to the course, but limited on time? Georgian Bay Airways will drop you off right at the dock of the course. Arrive in style and ready to play! We will fly you to a remote Georgian Bay Island, where you can hike its natural beauty, while overlooking Georgian Bay. 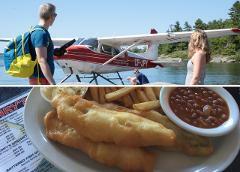 You are then transferred by boat to World Famous Henry's Fish Restaurant, after your meal we fly you back to our base.